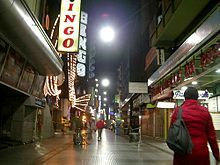 Bingo is a game of chance played with different randomly drawn numbers which players match against numbers that have been pre-printed on 5x5 cards.The cards may be printed on paper or card stock, or electronically represented, and are referred to as cards. Many versions conclude the game when the first person achieves a specified pattern from the drawn numbers. The winner is usually required to call out the word "Bingo! ", which alerts the other players and caller of a possible win. All wins are checked to make sure the person has not made a mistake before the win is officially confirmed at which time the prize is secured and a new game is begun. In this version of bingo, players compete against one another for the prize or jackpot. The number of all possible Bingo cards with these standard features is P(15,5) x P(15,5) x P(15,5) x P(15,5) x P(15,4) = 552,446,474,061,128,648,601,600,000 or approximately 5.52x1026. In addition to a straight line, other patterns may be considered a valid bingo in special games. For example, in the illustration above, the 2x2 square of marked squares in the upper-right-hand corner would be considered a "postage stamp". Another common special game requires players to cover the four corners. There are several other patterns, such as a Roving 'L', which requires players to cover all B's and top or bottom row or all O's and top or bottom row. Another common pattern is a blackout, covering all 24 numbers and the free space. Ready/Waiting/Cased/Set/Down/Chance - When someone only needs one number in order to complete the Bingo pattern, he/she is considered to be Ready, Waiting, Cased, Set, Down or 'has a chance'. Breaking the Bubble or "Possible" - The bubble is the minimum number of balls required to complete the Bingo pattern. This is the earliest point any player could have a valid bingo. Example: Winning pattern is 1 hard way bingo, a straight line without the free space. The minimum number of called numbers is five (four if each number is under "N") although it is not considered Breaking the Bubble or possible until one number in each column or four/five numbers in a single column have been called. Jumping the Gun - One who calls bingo before having a valid bingo. 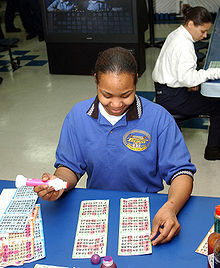 The most common situation is someone calling bingo using the next number in the screen before it has been called. Wild numbers - Many bingo halls will have certain games with a wild number. Wild numbers allow bingo players to start with multiple called numbers. Typically the first ball drawn is the determining factor. Standard - All numbers ending with the second digit of the first number. Example: First ball is 22. All numbers ending in a 2 including B2 is considered a called number. Forwards/backwards - All numbers beginning or ending with the wild number. Example: First ball is 22. All numbers beginning or ending with a 2 is considered a called number. If the first number ends with an 8, 9, or 0, another number may be drawn as there are no numbers starting with an 8 or 9 and only 9 numbers starting with a 0. Some halls will also redraw a number ending with a 7 as there are only six numbers beginning with a 7. False Alarm or Just Practicing- Term used when one calls bingo but is mistaken. This could be because of mishearing the caller or stamping the wrong number by mistake. One who calls a "falsie" genuinely believes he/she has a bingo. This is also known as a "social error." Another term used for this is a "bongo." Hard Way Bingo - A hard-way bingo is a bingo pattern in a straight line without the use of the free space.